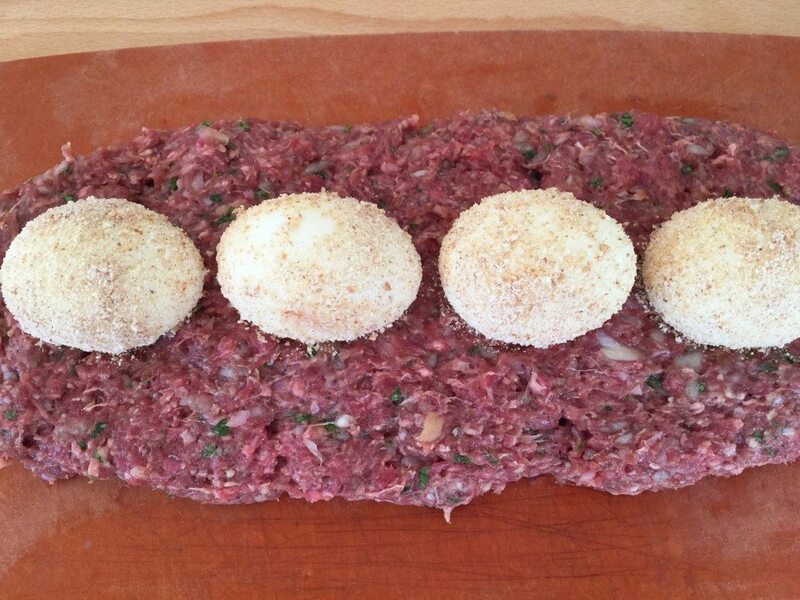 This German Meatloaf is called Hackbraten in Germany. This Meatloaf is filled with hard boiled eggs and known as False Hare – Falscher Hase. Soak the French roll in water. Boil 4 eggs in water for about ten minutes or use an egg boiler. Make sure to prick your eggs before cooking. Fry the shallots in a pan with butter until transparent. Remove from the stovetop and let them cool down. 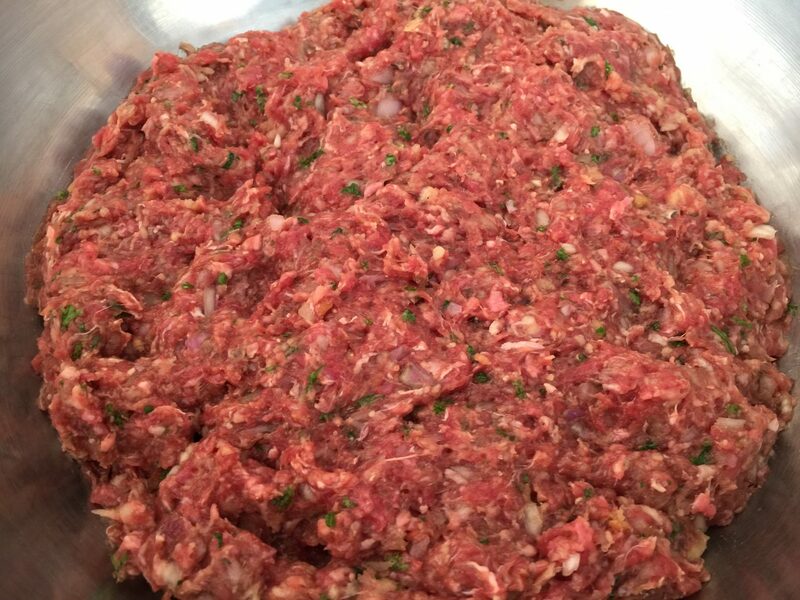 Mix the ground meat with 2 eggs, paprika, thyme flakes, nutmeg, salt, shallots, and parsley. Wring the water out of your roll between your two hands and add the roll to the ground meat. When the shallots have cooled down, add them to the meat. Mix all the ingredients together. 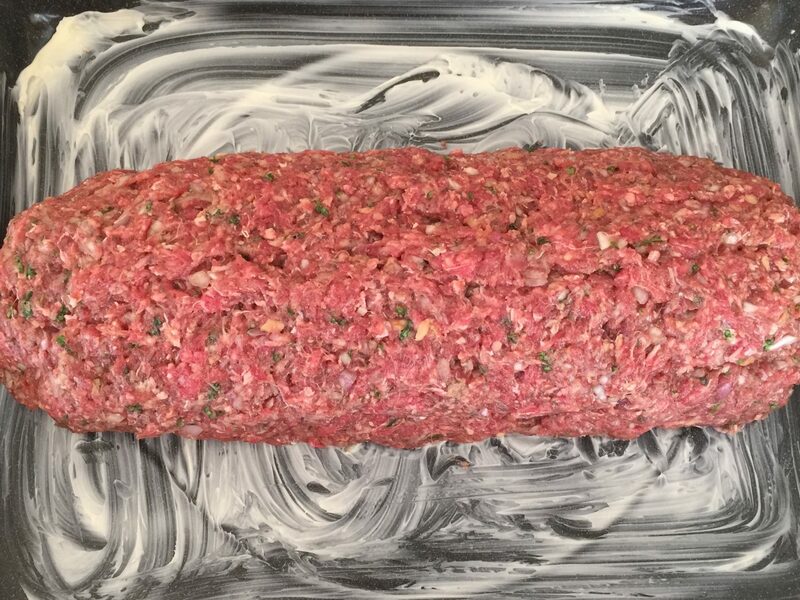 Divide the meat and form a roll about 30.5 cm (12 inches) long and 12 cm (5 inches) wide. Roll the hard boiled eggs in the breadcrumbs and place them in the center of the meat roll. Make a second roll and cover the meat with the eggs. Press the seam at the ends together and form one big roll of meat. Place the Meatloaf “False Hare” in a well-buttered roasting pan. Preheat your oven to 220°C-230°C (425°F–450°F) and place your meatloaf uncovered on the lowest rack. Bake for about 45 minutes and make sure you add water in the roasting pan from time to time. (Do not use all the water at once. You should just have enough water for the meat loaf not to burn). After 45 minutes, add the cut onions and tomatoes to the meatloaf and bake for 15–20 more minutes. Place your German Meatloaf on a serving plate. Add the rest of the water to the onions and tomatoes in the roasting pan. This should help to loosen the juice from any remaining meat. Pass the liquid from the pan through either a sieve or a food mill. Bring the liquid to a boil in a saucepan. Dissolve corn starch with some cold water in a cup and add to the liquid/gravy to thicken. Your “false hare” meatloaf and gravy are finished. Serve with one of the salads of Oma’s salad bar, or a mix of sweet peas and carrots and a side of Oma’s mashed potatoes. Your family will enjoy it!